At our newest location, you can expect to see the usual vast display of show buildings and a team of friendly advisors will be on hand to help or to discuss any queries you might have. 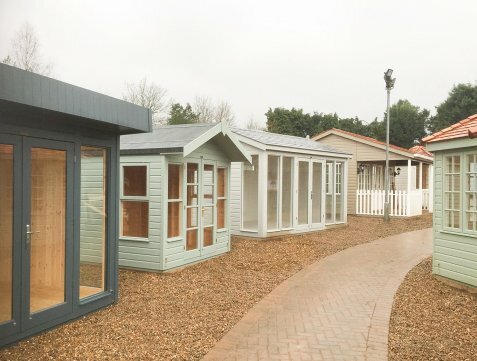 Our range of show buildings includes models from our selection of Summerhouses, Garden Sheds, Garden Studios and even our show-stopping Garden Rooms. You can see for yourself the high quality of the buildings and consider each step of the process according to your own needs and requirements. If you would like to visit us at the show site, we are based at the Notcutts Garden Centre making it an ideal day out for any keen gardeners or for those with an interest in the outdoors. Located close to both the Surrey Hills Area of Outstanding Natural Beauty and the National Trust Winkworth Arboretum, it is a nature-lover’s paradise. Just a mile from the centre, the self-proclaimed largest village in England is a wonderful place to visit, with an impressive yet charming high-street, church and Arts Centre all there to enjoy. You can find us online here, by using the postcode GU6 8LT or by getting in touch with us on 01483 310260. We hope to see you there soon!